Scrivener is meant for drafting manuscripts, and isn’t focused much on formatting them. But it’s understandable that you might have preferences for how the text in your editing window appears. Here are a few quick tips for setting it up. The following steps will let you set the standard for all new documents in all projects within Scrivener, but will not change existing documents. 2. Click the Formatting button at the top. 3. Click in the small text editor at the top and use the formatting buttons to set up the way you want your documents to look. 4. All new documents in all projects will use this format (unless you set a project-specific format [Mac only], which I'll get to in a minute). 2. From the row of buttons along the left side, select Editor. 3. Click in the Default Main Text Attributes editor at the top of the window and use the formatting buttons to set up the way you want your documents to look. If you have existing documents that don't match the default formatting (either the out-of-the-box settings or the changes you just made in the previous section), you can convert them with the following steps. 1. Select the desired file or files in the Binder. Mac users can choose a folder or multiple files, Windows users must select the files separately from the folder. If not in Scrivenings mode (multiple document view), go to View—>Scrivenings. 2. Mac users only: Click in the text in the Editor pane. If your cursor is not in the Editor, the formatting options are not available. 3. Go to Documents—>Convert—>Formatting To Default Text Style. A small window appears. 4. Leave all boxes unchecked in order to convert all aspects of the style, and click OK. The selected document is converted to the standard format you set in the previous section. NOTE to Mac users: If you have already set a project style as below, converting a file with these steps will convert it to the project text style instead. 3. To use the settings in the current document, click Use Current. Otherwise, make changes in the Editor pane using the format bar that's provided. All new documents created within that project will use the default text style you just created. To change an existing document to the default (whether set here or in Preferences), go to Documents—>Convert—>Formatting To Default Text Style. Presets allow you to apply a previously defined set of formatting rules to existing text. 1. Format a section of text to match the settings you want for your preset. Or, find a section of text that is already set up the way you want it. 2. Click within the properly formatted text. 3. Go to Format—>Formatting—>New Preset From Selection. 4. Give your preset a name that specifies what it is. For example, I used TNRwIndent to represent my double-spaced, Times New Roman 14 pt with first-line indent. Once you have created a preset, you can apply it to a paragraph or a selection within your document. 1. Click within the paragraph, or select all of the text, to which you want to apply your preset. 2. Go to Format—>Formatting—>Apply Preset. 3. Select the desired preset to apply. You can easily delete a preset that you no longer want. 1. Go to Format—>Formatting—>Delete Preset. 2. Select the preset you wish to remove. If you have text with a special format—maybe to represent letters, text messages, emails, or quotes—that you don't want to be overridden when you compile the project, you can preserve the font, spacing, size, indents, and alignment of it. 1. Select the text to preserve. 2. Go to Format—>Formatting—>Preserve Formatting. The selected text is surrounded by a dashed line and highlighted in pale blue to show that it is preserved. Remove preserved formatting with the same procedure. Want to know more? Sign up for an online class, read more Scrivener articles, or schedule a private training session. Write on! I have a semi-related comment… mostly it’s a question about your Scrivener class. I’d like to join, but would like to know what days and times it will be to make sure that it works with my work schedule. I’m still not certain if I’ll take it or not… Scrivener works great the way I use it, but I’m sure I could be utilizing it more fully. Hey, Kali. The class is run on an email loop. I’ll be posting lectures (is there a better word for that?) 3-4 times per week and then giving you time to try out each feature and ask questions. The class runs the entire month of May. I hope you can join me, but no pressure! Yay! That’s so much better than a webinar at noon. I wouldn’t have to do them at work. 🙂 That makes it more appealing, certainly. Not easy to post Comments here…but I wanted to say: Bless you! Sorry you had trouble, Barry. But thanks! Just signed up for your class! I agree with tospinayarn that I like what I’m doing with Scrivener so far, but I really could use it better. Thanks, mesummer! I look forward to having you in the class. I know what you mean about standardizing your formatting. I’m the same way. Glad the post helped! I had signed up for the scrivener class back in jan (jan 29) but it was for an april class. was it pushed to may (which is cool) but i was worried i had missed some emails. Tanya: The class sign up deadline is April 30th, so maybe that’s where the confusion came from. I have you on my list, and we’ll be starting May 1st. I look forward to seeing you there! thank you for the clarification. i am looking forward to the class. I just purchased Scrivener and I don’t know where to start. I am writing a novel and don’t want to lose momentum trying to figure Scrivener out. Can you recommend a website that will show me how to work it easily? Thanks. Literature and Latte has a lot of tutorials to help you get started: http://www.literatureandlatte.com/videos.php, so you might check there first. If you still need help in the spring, I’ll be offering another online class. Hope that helps, and good luck! Thanks. I figured some of it out already. Just haven’t figured out how to add a prologue without it becoming part of chapter one after I hit the compile button. Any ideas? Isabel: Are you putting the prologue in its own folder? That’s what I’d do. In which case you’d want to use folder names for your chapter titles instead of the automatic chapter numbering. Or, you could just split out the prologue once you export to your word processor. Good luck! Karissa: I think your best bet would be to contact Scrivener support. If it’s a bug they’ll know about it, and if it’s not, they can walk you through how to fix it. Karissa/Isabel – I worked out how to this morning. When you go to compile, the expanded options show things like contents, separators, formatting, transformations etc. and you need to go the formatting section or tab (depending which version of scrivener you use). Once there you can edit how each level and/or its descendents are formatted. e.g. click “Level 1+” and the ‘Modify’ and then click “Section Layout” and you can change how all levels from the root and below are handled. So, what I’ve done, is removed the Prefix from Level 1+, and added (cut and pasted in fact) a prefix to Level 2+ instead. The code for the prefix needs to be “Chapter ” (without the quote marks). This means every level 2 file in the binder is a chapter. I keep chapters inside folders representing parts and anything before part 1 in the root level therefore doesn’t get a chapter number – so that can be quotations and the prologue. You can also set Level 1 folders to have prefixes so your parts have names. Looks like part of the code got stripped. it should be chapter followed by $t inside angle brackets – but just move what’s in the prefix in level 1+ to be level 2+. TheMichaelMoran: If you’re copying and pasting, trying using Paste and Match Style (Shift+Option+Command+V on the Mac, Ctrl+Shift+V in Windows), instead of using the standard Paste command. That won’t give you plain text, but it’ll match the text settings to your project’s default style for new documents. Hope that helps! Is there a way to assign keyboard shortcut to the formatting presets I make? It seems kinda basic but i cant find a way to do that. Can you please open my eyes on that matter? Omer: Sorry for the delayed response. I’m still catching up after the Thanksgiving holiday and traveling. 1. Copy down the name of the preset exactly as it appears in the menu. 2. Go to your Mac’s System Preferences. 3. Choose Keyboard, and then click on the Keyboard Shortcuts button at the top. 4. Click Application Shortcuts in the list to the left. 5. Click the [+] button at the bottom. 6. In the pop-up window that appears, click the top drop-down button and choose Scrivener.app. 7. In the Menu Title text box, enter the name of the preset (exactly as it appears in the menu). 8. Click in the Keyboard Shortcut text box and press the combination of keys you’d like to use for the shortcut. NOTE: If the combo is already taken you won’t get a warning or anything, it just won’t work. When you go back into Scrivener and look at the preset–either on the format bar menu, or in the Format–>Formatting–>Apply Preset submenu–you’ll see the keyboard shortcut you assigned. If it doesn’t work, follow steps 1-4 above, click the arrow next to Scrivener.app in the list to see all the shortcuts. Double-click your preset shortcut and enter a new one. Repeat until you find a combination that works. What a world are we living in if you are sorry for responding after 2-3 days… that’s perfect! and THANKS!! it works. But again – it works and I only have to do it once. Thank you so much for the tip, I really needed that preset-shortcut-assignment, wonderful website and book (which I’m not done with yet) btw. Great, Melissa! Thanks for letting me know. Good luck with revisions. I just implemented your very helpful preset with shortcut function described above. It works beautifully (thank you for sharing) apart from the fact that the paragraph present always applies the formatting to the whole paragraph, even if I have only selected a few words within that paragraph to use the preset on. Any ideas what I may have done wrong there? You’re a bloomin’ marvel! Thanks Gwen! I’m currently compiling my document and when I downloaded it to my nook, 40,000 words is only 108 pages. I want 250 words per page and have this setup in scrivener, but four nook screens equals a page which is about 500 words a page. How do I fix this? Leigh: You can’t control the number of pages that show on the Nook (or another reader for that matter). It’s going to change depending on the size of the font the person reading it chooses, which size reader they have, and so on. You might be able to force it using HTML, but I bet it wouldn’t look good, and you would need to do that outside of Scrivener. Good luck! Thank you, for replying. I’ve noticed other e-books have one or two nook screens per page, is this because it’s formatted from a different program? Aaa, your tips saved me from having to retype my nomoredefault formatet scene. Something else I just discovered that’s even quicker. If you go to the inspector (View → Layout → Show Inspector), select your prologue document(s) and check the “Compile As Is” box, Scrivener will not number it/them. something that’s been driving me crazy today: I’m just wondering if Scrivener will update styles that I’ve applied manually? You know, if I wanted to change my Character Template headings consistently all the way throughout my project? It’s not a big matter like formatting how my actual book will print, because this is all stuff in my Scrivener research notes. But it’s the sort of thing that bugs me if I can’t figure it out. Thanks. Awesome blog, and great tips above. Cheers. At least I know, and can stop banging my head against a brick wall trying to find it! But I heard a rumour that a find & replace styles may be coming, but it could take some time. Hi, Gwen…I have Scrivener for Dummies, working my way through it slowly. I have a question not addressed in your book. I know I can add icons to file and folder names, and that there is a check mark (tick) icon available. But what I need is a way to add check marks in the TEXT of a document. The font Wingdings2 includes a check mark, and if I remember correctly (I may not) it’s Shift P, but when I insert this the mark is badly distorted, I can’t even make out the shape. Do you know why this occurs? Or do you know of another solution, or some other font that has a check mark???? Toni: This differs between versions. The Mac version has a checkmark bullet for lists, the PC version currently does not (no idea why). On the Mac, if you go to Edit—>Special Characters, there are some checkmarks under the Bullets/Stars section. In Windows you can access special characters from Edit–>Character Map. I was able to copy the checkmark in Wingdings, but when I pasted it, it came out as a hand holding a pen. However, when I selected the incorrect character (which then shows as Wingdings font in the format bar) and used Edit–>Paste and Match Style, it turned into a checkmark. For some reason it’s not switching to its own font the first time. Not sure if that helps. Good luck! I’ve copied your remarks about Wingdings to ponder – I’ll give that a try. Your expertise is a blessing. Thanks for your help. I like Scrivener but have hit a few snags getting to run how I want. You have helped me resolve most of those! Here’s something I don’t get. I created a project by pasting in from Word, then used document/convert tand all is well. Until I copy paste or select and drag any text. If I don’t use “Past and Match Style” the pasted text is always converted to New Times Roman in smaller type, even though my Scivener doc is all Courier and the Word doc I pasted from is all Courier and all my presets are Courier. I don’t know where the Times is coming from. C. Stuart: Are you using Windows? I found notes about a similar bug on the forum, relating to copying from an internet browser. Their recommendation was to select all of the text and copy and paste the whole thing again. 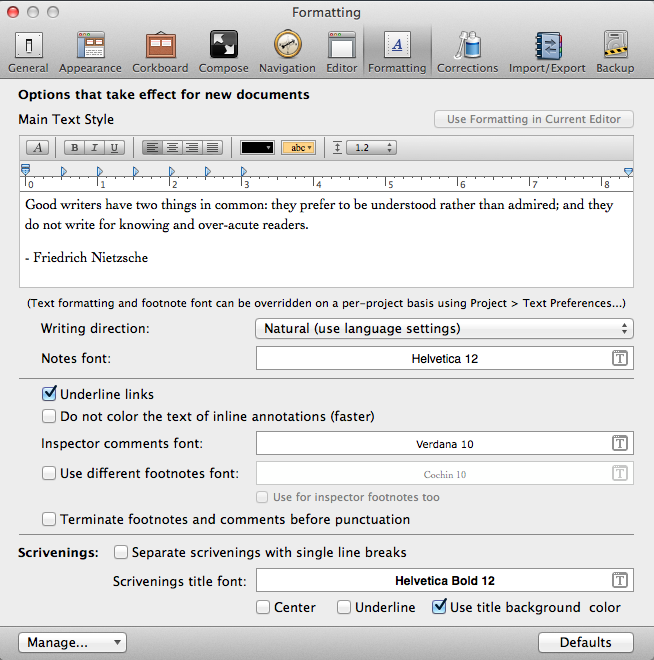 Then run Document–>Convert–>Formatting to Default Text Style again. For some reason it takes two steps to strip out the extra formatting. Have you tried using Import instead of copy/paste? The file will be converted to RTF during the import process, then you can convert the formatting and it should stick. HTH! Any idea of a way to set up a keyboard shortcut to apply a preset? It gets pretty old having to click through the menus. Even going through the menus via using alt- is a big annoying: alt-R-F-A (select a preset). Joseph: There is a button on the format bar with the list of Presets (far left button with a pilcrow [backwards P symbol] and letter “a” on it). That’s probably your easiest route, but it requires the mouse. You can modify/create some keyboard shortcuts under Tools–>Options–>Keyboard in Scrivener, but I don’t see any preset menu items there. Sorry I can’t be more help. Nah, don’t worry about it. It doesn’t look like there’s a way to do it. Alt-R-F-A it is. Thanks for the reply. How the heck to I shift a bullet point to the right or left in Scrivener(mac)? Select the bullets and go to Format->Text->Increase/Decrease Indents and choose either Increase Indents or Decrease Indents. To decrement the bullet (make it a lower level bullet in the hierarchy), move your cursor to the left of the first word in the bullet and press the Tab key. Shift+Tab increments it, if possible. Thanks for a really useful article, Gwen! I have one question that’s still bugging me, though: once I’ve changed my formatting presets, is it possible to revert my presets to defaults? Over the past few years I’ve changed various formatting presets without really knowing what I was doing, and I would now like to completely reset Scrivener to “factory settings”, including the formatting presets. Any idea how I should do this? Jim: Glad it was helpful! You can reset your global settings in Scrivener>Preferences (Mac) or Tools>Options (PC) by clicking the Defaults button. I’d recommend you click Manage and save your current settings first, just in case you change your mind and want to revert. However, this doesn’t affect the format presets. You can recreate the presets on your own, but there’s no easy way to restore them (unless you want to mess with plist files and such). You could uninstall Scrivener and download a new copy of it. That won’t affect your Scrivener projects, and should give you a new factory version. Just make sure you have your registration key on hand from when you purchased the software. Hi, Saul. Unfortunately, the text engine Scrivener is based on is not very robust when it comes to lists. As you’ve probably already discovered, it’s easier to format the list while you type it than to go back and apply formatting after the fact. Especially if you have multiple levels (indents) within your list. If you start off a list with 1) and then move to the next line and press the Tab key to indent, you may get something like the – symbol. You can change that via the bullet list dropdown in the Format bar to A). Thereafter in that list, all indented items will use A) B) and so on, even if you use Shift+Tab to add some more numbered bullets first. But I haven’t been able to create a preset or shortcut that will correctly apply bullets to an entire existing list. The only way I can think of right now to make this at all quicker for you is to create a preset (Format–>Formatting–>New Preset From Selection) for both the 1) style and the A) style, then when you’re creating a new list, apply the 1) style to the first line and create your list, then when you get to an indented section, apply the preset to that line. The rest of the list should follow accordingly. Once you have created your presets, you can then add keyboard shortcuts for them (through Windows or Mac OS, depending on what you’re using). Wish I had something better for you! Hi Gwen, Have you tried Scrivener 3? I’m looking for the equivalent of Format–>Formatting–>New Preset From Selection to create format presets, and not seeing a way to do that. Have you done so? Thanks! Hi, Mark. Yep, I even have a free mini-course on the differences between Scrivener 2 and 3 that you might find helpful. You can find it at https://scrivenerclasses.com/course/jump-into-scrivener-3-your-transition-guide-for-mac/. In Scrivener 3, Presets have been updated to Styles, which work more like Styles in Word. The nice thing is that updating a style now updates all text formatted with that style. To create a new style from the current selection, go to Format>Style>New Style From Selection. HTH! Hi, Gwen. Love your blog. I have a question that I can’t seem to figure out. In the old version of Scrivener for Mac, the preset text colors in the format bar were black-red-green-blue-purple. I use all of those colors for different things in my draft. Now the purple has been replaced with gray and I prefer the purple. Is there anyway to change that? Thanks, Loretta! Unfortunately, I can’t help you with this one. I thought I had an option that would work, but it didn’t. 🙁 I’d recommend hitting up L&L tech support or the forum. Good luck!